A couple of months back Randy & I did something I’d been planning for months – we took a trip to Invercargill, just to visit Bill Richardson Transport World. In 1967 a young Bill Richardson had an urge to find an old 1933 International D1 truck that his grandfather had owned. He found it two blocks from his house and paid just £5 for it. And so began a life-long passion that would, almost 50 years later, become Bill Richardson Transport Museum. This collection is staggering. 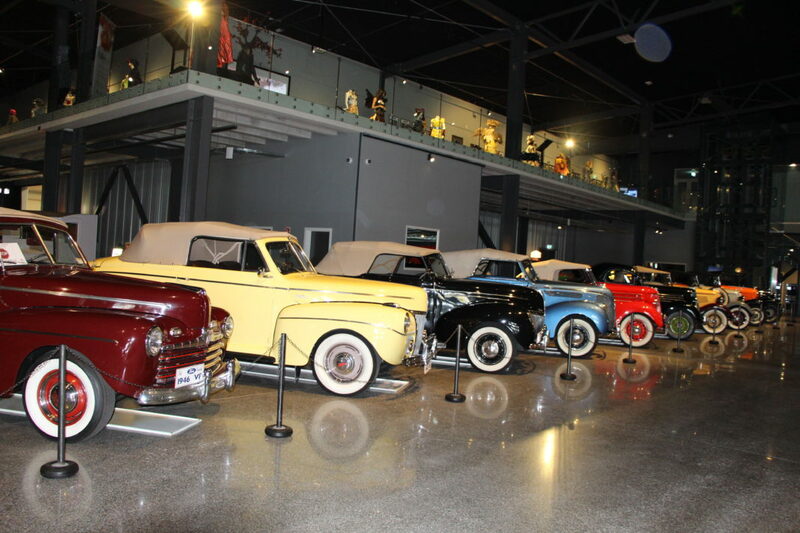 There are hundreds of motor vehicles of every vintage on display – anything and everything that’s collectible. It takes up an entire city block, so its BIG! In fact, it’s the largest private automotive collection of its type in the world. We spent the better part of a day, just wandering amongst the vehicles, watched a movie (Pork Pie), and eventually wandered back to our wonderful accommodation. Sometime later, tired and hungry, we enjoyed a wonderful evening meal at The Grille. The next morning, we repeated the exercise at Classic Motorcycle Mecca, stunned by the line-up of British, American and European built bikes. If, like me, you’ve heard of this place, but haven’t yet been, it’s almost worth visiting just to experience the loos. At Bill Richardson Transport World, one of three sets of quirky toilets included a very retro ‘Ladies’, featuring pink, blue and yellow old-fashioned pedestal hand basins with vintage hand mirrors adorning the walls. In the ‘Mens’, as you’re standing at the urinal (so I’m told), you look out through a one-way mirror into the marvels of ‘Bill’s Shed’ as other guests wander past, none the wiser – very quirky!